I thought I would start a Quilt Roll Call. As I take pictures of the quilts in the stack from this post, I will do a blog post about them. This is mainly to document the quilts since I was not good about doing this in the past. If my feeble memory will allow, I will include any info I can about the pattern, fabric line and quilter. This is actually one of the very few quilts that I have made using hand applique. A variety of designers had brushed cottons in their lines such a Brannock and Patek, Brackman and Thompson and more. never actually put into production. We call those BAD STRIKE OFFS. How can a fabric be bad? Sometimes there are just so many choices from the mill for the designer to choose from. I am glad it is not my job to eliminate the fabrics. They seem like orphans to me. I collect them and someday will have a quilt that none of the fabric ever existed. Is that an oxymoron? …..make a quilt from fabric that never existed? Here is a closeup of the quilting and my WONDERFUL, INVISIBLE APPLIQUE stitches. I think my eyes were much younger then. Hope you enjoyed Quilt 1 of the Roll Call. I did enjoy reading about Quilt 1 of the Roll Call. I always enjoy reading the stories behind the quilts. Interesting that you have themes for the backs of quilts. I would keep the bad strike offs too! I look forward to reading the next Roll Call. Great idea to do a quilt roll call for those quilts that still need to be documented. And I LOVE the idea of a theme for backings for the entire year…that would make a terrific blog post in and of itself…themes for the past years…what a great idea! Beautiful quilt! You are so lucky to be able to work near to those beautiful fabrics. Love the story of this quilt! I'm so glad you're doing this. 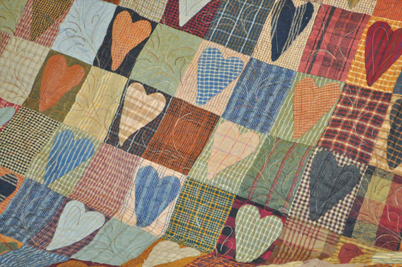 I love the stories behind the quilts as much as the quilts themselves. This one is lovely nad looks like it belongs in a log cabin. I love the warm homespun look – its so inviting. I love brushed cottons! They're wonderful for applique. Did you leave the brushed side up or use the smooth side up? Love the idea of a roll call! And, yes, you do have a wonderful job. I love the thought of begin able to bad strike offs — takes recycling to a whole new level! I do seem to fondly recall some of those plaid and stripes. The prints we design are fun to use and the wovens will always be my first love. 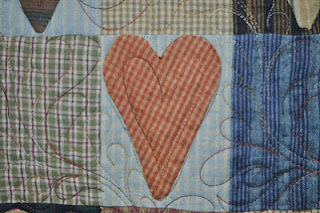 Great choice of colors and textures for you great heart quilt. 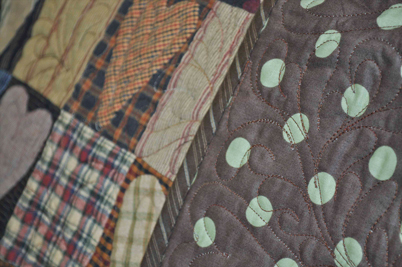 I love reading the stories behind your quilts….how fun! I hope you do make a quilt made from fabric that never existed. (that is hilarious to think about!) I never would have thought to pick a theme backing for quilts each year. I think I'd repeat polka dots every other year! I can't wait to read about the next quilt on your pile.